Though Mumbai Indians let many of their former players go, Anant Ambani said the proceedings went according to plan. 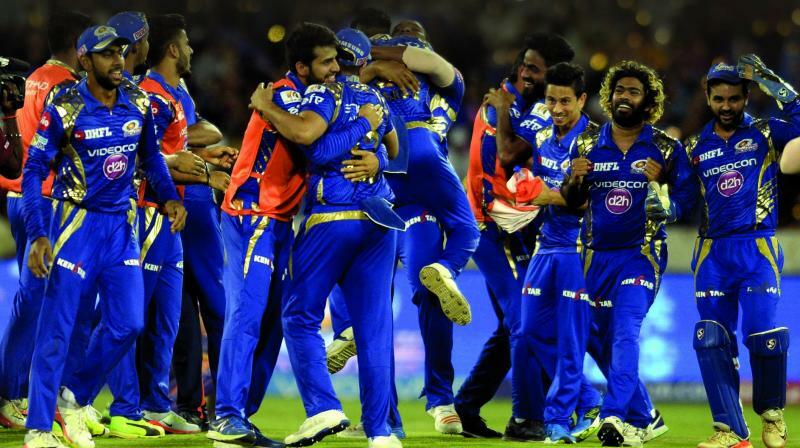 Former Mumbai Indians team players celebrate their victory against Rising Pune Supergiants after the 2017 IPL Twenty20 final cricket match. The return of the big guys, Chennai Super Kings and Rajasthan Royals, suggested that there would be a new auction for the players. Most of the sides were keen on retaining their core from the past seasons, but it was a given that the franchises will not have the exact same squads as the previous seasons. Mumbai Indians, the three time champions, lost out on a major chunk of their players. The Neeta Ambani-owned team will go into the new season without former stalwarts Lasith Malinga, Harbhajan Singh and many more. Akash Ambani reveals that they did not lose out on anyone as they had already figured out on who to get on their side. “We are following a decision as planned for our auction and we are unemotional about it,” said Anant who was present at the players auction in Bengaluru. Leaving the former winners behind, the Mumbai outfit decided to get new players on board. Krunal Pandya, who proved to be handy with both bat and the ball over Malinga or Bhajji was bought by the Ambanis. Anant calls it a pre-decided move. “We are vary happy with what we have got today. We got two players, who we wanted to. We got the players as per our strategy of today,” he further added. To accompany Jasprit Bumrah who will surely lead the pace attack for MI, the franchise signed Australian pacer Pat Cummins and Mustafizur Rahman, who announced himself on the big stage last year with Sunrisers Hyderabad. Both of them are somewhat a replacement for Lasith Malinga and Mitchell McClenaghan, who were left out by the Ambanis during the auction. “We back ourselves to two foreign fast bowlers. We have won three championships doing that so we would like to not unsettle that aspect. The advantage with both Rahman and Pat is that they are 22 and 24 respectively, so we have them for years to come and we can nurture them,” he added. Even after missing out on the above mentioned players, MI made sure about keeping the core intact. Hard hitting West Indian, Kieron Pollard was brought back to the side with the owners using Right to Match (RTM) card.